Before I started my business, I never took note of people talking about how frustrating it is to employ a reliable shop assistant. After operating a shop for exactly 5 months as of today, I have started to realise employing a good employee is not as easy as I first thought. We have to ask my staff to leave because she has becoming dishonest and taking advantage of our kindness. She has been coming late to work and taking leaves with only giving me one hour notice with all sort of reasons she can think of. We have given her warnings repeatedly for such a behaviour. We have to finally laid her off on last Saturday when she turned in to work 3 hours late. Without an assistant, we have to temporary closed our shop while looking for a new one, luckily not for long. Thank God that we managed to get a replacement after spreading words around. Hopefully the new shop assistant will be better than the previous one. She will be commencing her duties tomorrow. I am relieve at the same time worry whether she can handle the job alone as she is very young and inexperienced. I am unable to be in my shop because I am still under employment with a boss. Just hope that I can becoming my own boss very soon on a full time basis. 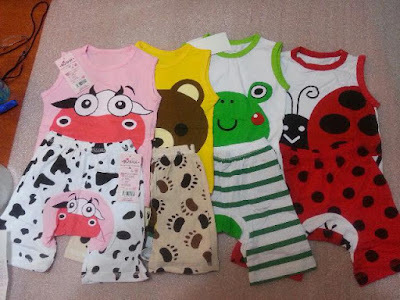 Here are very cute singlet and pants set selling at my shopping for 2 to 7 years old. Those singlets and pants are so cute!